Our pets are our best friends! Let's treat them as such with some accessories of their own. 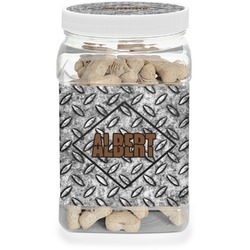 Nothing says "I love you" like a new doggy treat jar. 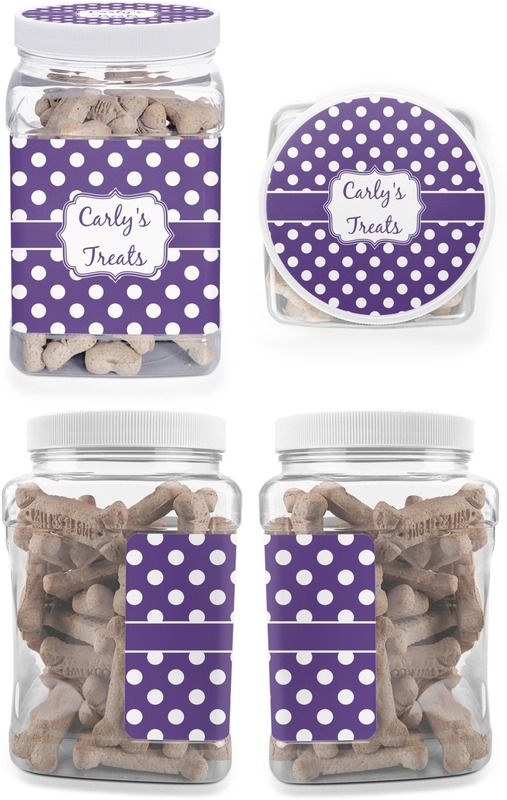 This is the perfect way to store your dog treats on a counter or in a cupboard. 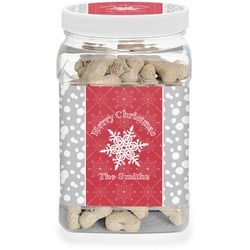 Being made of a durable plastic, this 1/2 gallon jar is the perfect place to keep the treats from any naughty pet paws. Each jar has a plastic, screw-on white lid with your personalized sticker label on the front of the jar and the top of the lid. Each jar has indentions in the back in order to be easily gripped. Their square shape even makes them easy to store! When washing your pet treat jar be sure NOT to soak it in water. Simply take a wet cloth to it or rinse it momentarily. Now, have fun designing your jar's labels! Pick out a cute animal pattern or something that fits your pet's personality. There are thousands of backgrounds in our system to choose from. Label it with their name or something simple like "Doggy Treats." Have fun with it! If you ever need assistance in our design center be sure to contact us. We are always happy to help. Want to see more pet products? Go to our pet section where your will find anything from bowls to collars. You are bound to find something you love or need.